I just got Olive’s newborn photos back and finally got her birth announcement made! Not sure it’s ever going to actually go out in the mail but at least I have a digital copy of it. =) I hope to have more of her photographs up on the blog soon. They turned out so well and I can’t wait to share them! And… I also just have to share this sweet video of Eloise singing Happy Birthday to Livy. She adores her baby sister so much!! 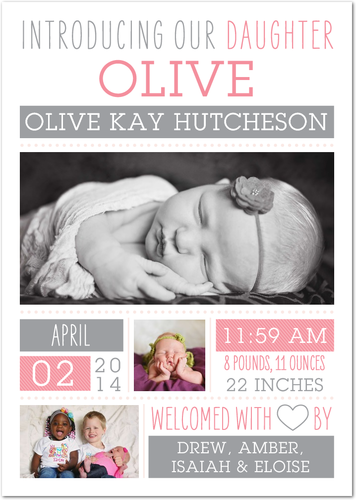 Adorable birth announcement! Things have gotten so much cuter in the last 18 years since I had my last. Thanks for sharing. That's a beautiful announcement you created! And the video is just so heart warming. I couldn't help smile from ear to ear seeing Eloise being such a great big sister. Thanks for sharing!